Coffee is to an Austrian as pizza is to an Italian; it’s a staple of life and a large part of the culture. Coffee houses aren’t only found within Vienna though, and are found dotted throughout the entire country of Austria. Coffee is meant to be enjoyed and sipped slowly within these traditional Austrian coffee houses. This isn’t your typical Starbucks grab and go culture. 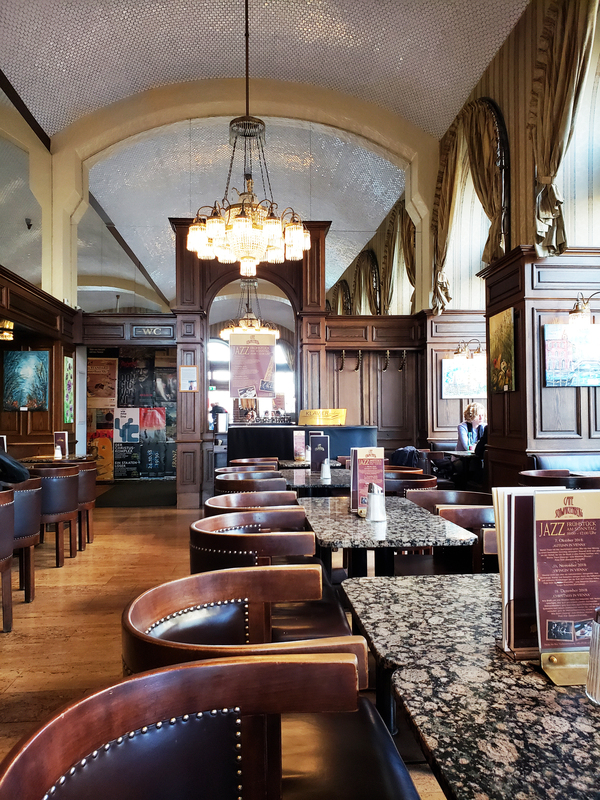 You sit down, relax and revel in the atmospheric surroundings of the interior, taking in all the scents, sights and sounds that a coffee house would have. Smelling the freshly ground espresso beans in the air and gazing upon rows and rows of bright jewel toned coloured cakes so elegantly displayed behind glass for patrons to gawk at with desire; what’s not to love? 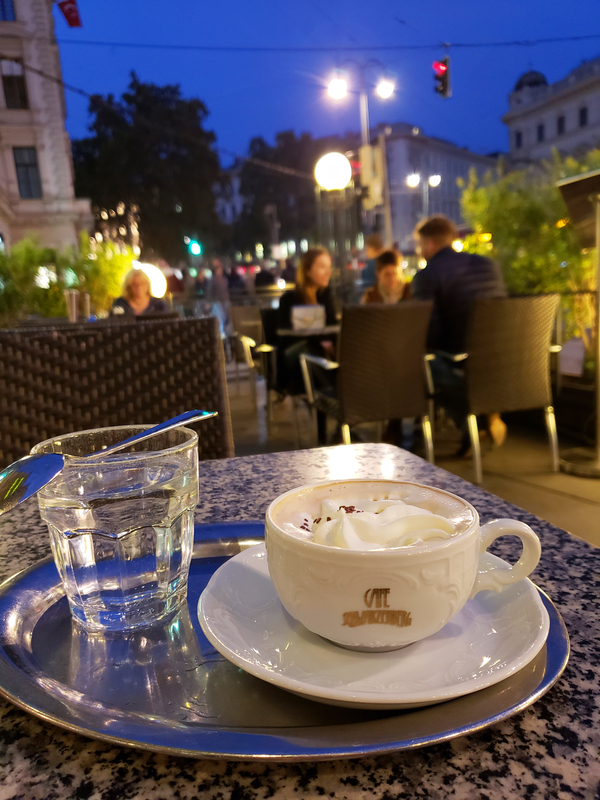 Most people visit Austria thinking that there are only traditional coffee houses within Vienna, but they would be wrong. Austria has many traditional coffee houses throughout the country, especially in the larger cities of Vienna, Salzburg and Innsbruck. 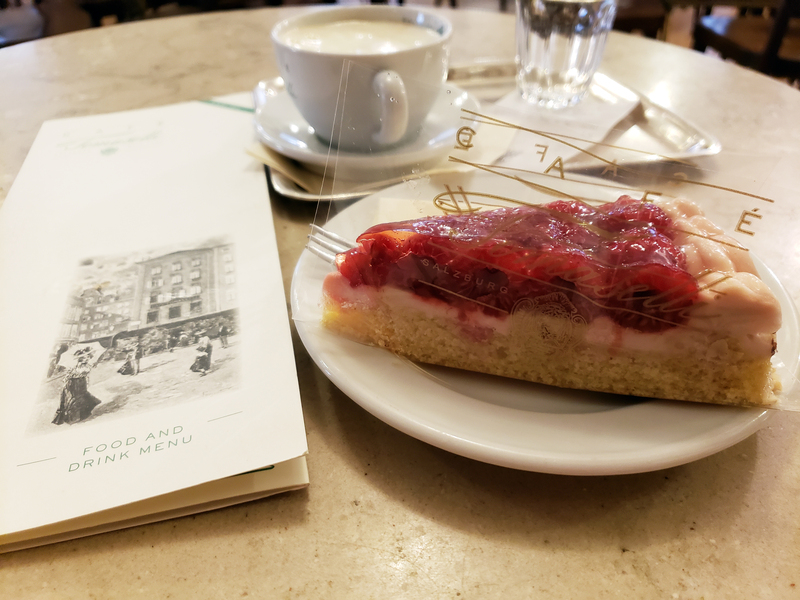 Yes, Viennese coffee houses are the most popular and most frequently visited, but why stop at only visiting Vienna’s coffee houses when there are lots more to see and experience with just as much history and delicious goodies to be eaten. 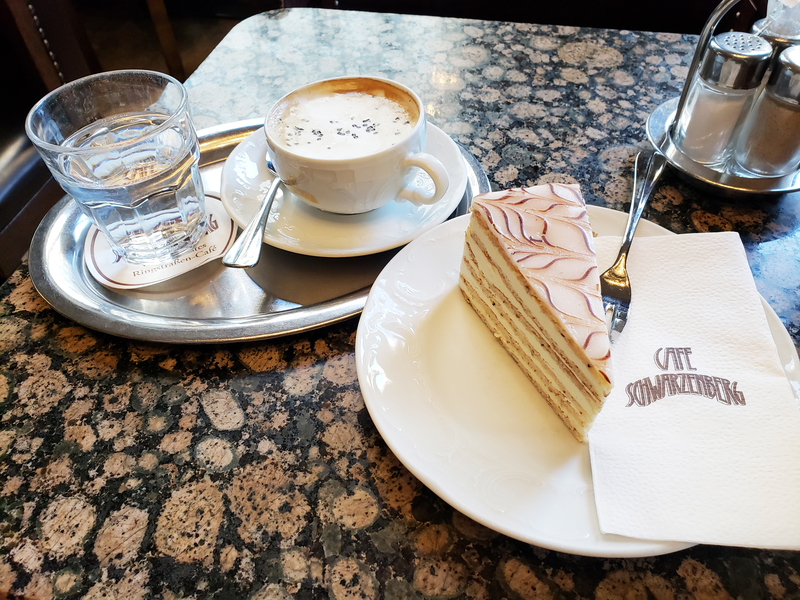 I knew that my travels through Austria would lead me to trying some of Vienna’s coveted coffees and cakes, but I wanted to experience more than Vienna’s coffee houses. As I hopped around the country visiting different places and reading up on the interesting history behind each coffee house, I instantly fell in love with just how much these coffee houses actually felt “like home” and were incredibly inviting, comfortable and cozy, like an extended part of one’s actual living room at home. 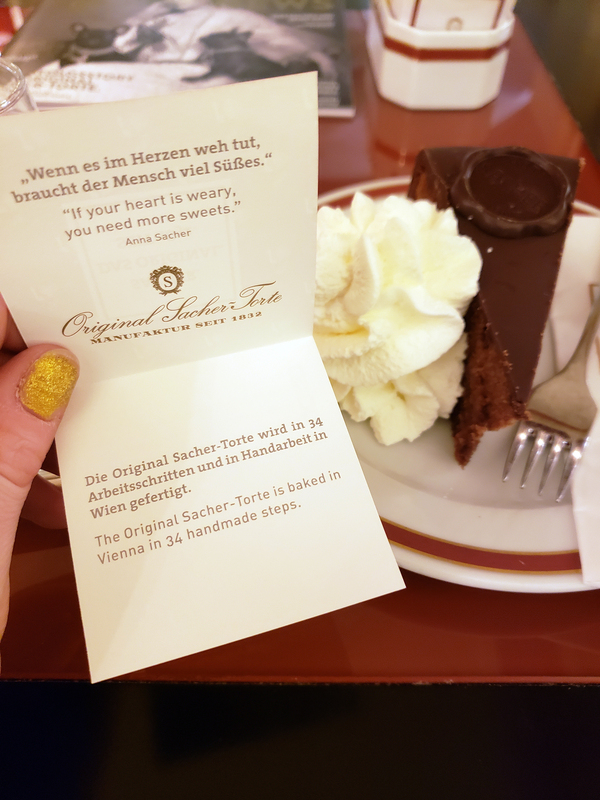 So whether you are only visiting Vienna, or traversing around the entire country, here are the five W’s to help you gain an understanding of visiting a traditional Austrian coffee house. 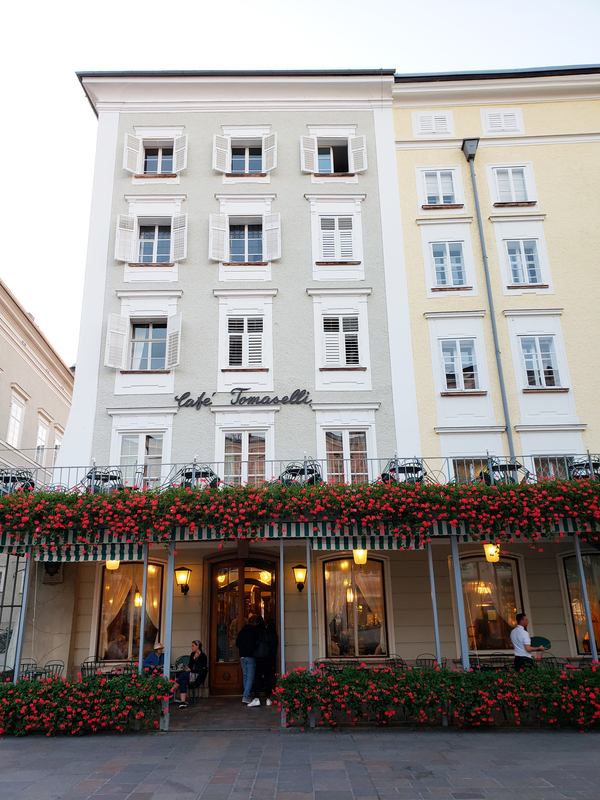 Who Made The Traditional Austrian Coffee Houses Famous? 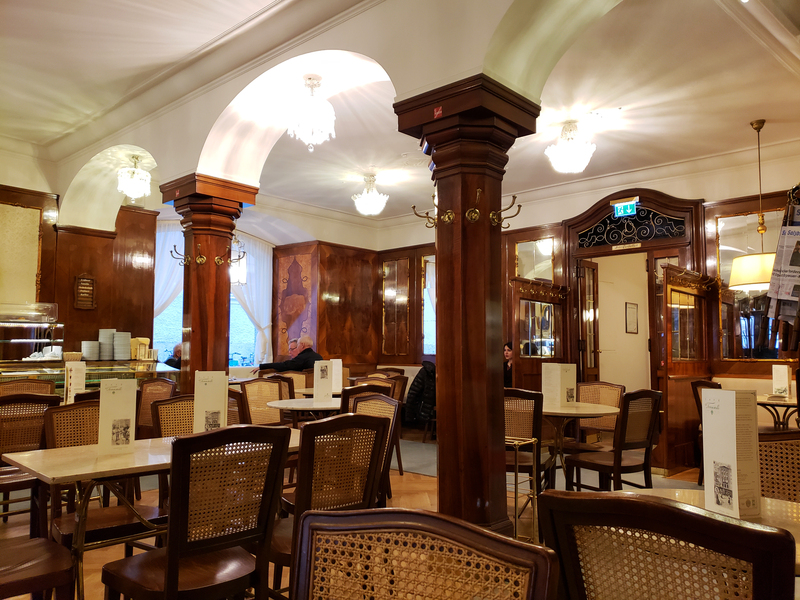 The Austrian coffee house is still popular to this day mostly because of the many historical figures that have graced the inside of their traditional walls. Emperors, musicians, poets and political figures are just some of the many VIP’s that have visited these traditional coffee houses over hundreds of years. Some of the famous names that you may have heard of are Sigmund Freud, Leon Trotsky, and Gustav Klimt and Johann Strauß, Mozart, and Beethoven even performed in some of them, treating visitors to a musical treat. The famous writer and poet Peter Altenberg even had his mail delivered to Café Central, which was his favourite haunt. The staff is also an integral part of making the traditional coffee houses famous. Dressed to the nines in tuxedos, long-tail coats, or white dress shirts, the ambiance and impeccable service is a massive draw for visitors. What Is A Traditional Coffee House? A traditional coffee house is more than a place to enjoy your morning java. It’s a place that mixes culture, class, decadence and a comfortable ambiance all rolled into one place. 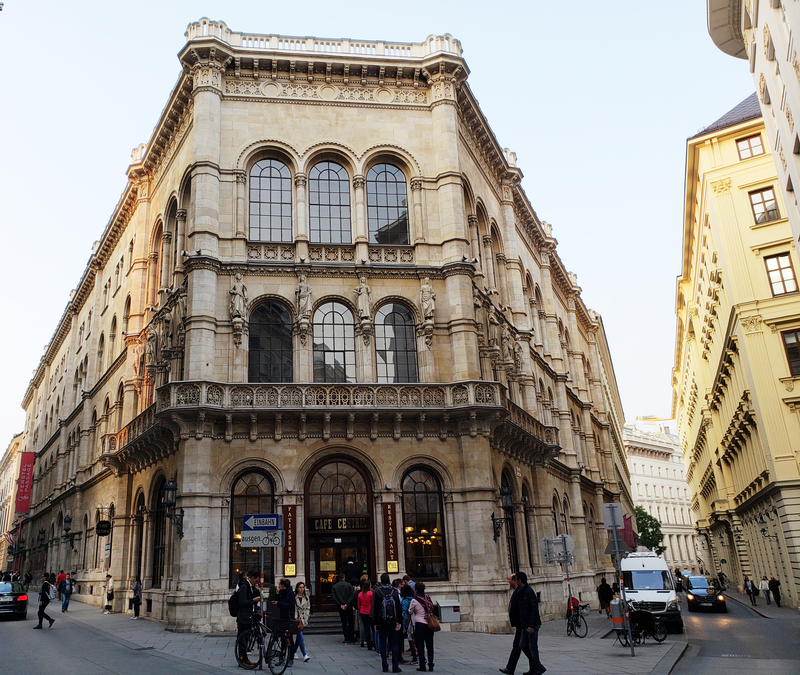 Within Vienna alone, there are approximately 850 coffee houses, about 150 of them are considered traditional. Decked out with wooden floors, wooden walls, simple furniture and even some with stunning vaulted ceilings adorned with glistening chandeliers, these coffee houses are considered to be an extension of your living room meaning that you could order up a coffee, a slice of cake and linger for hours reading a newspaper without being pushed out. 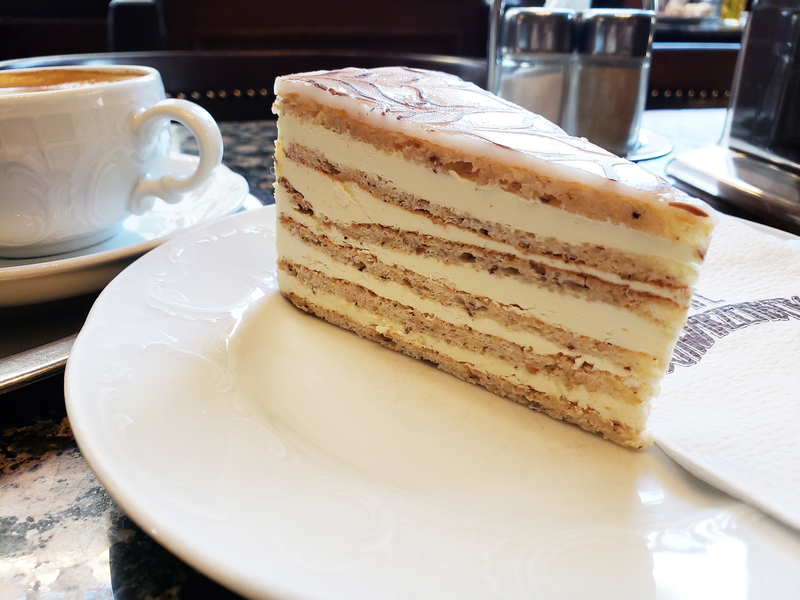 These days they have modernized a bit by providing WiFi, so you can tell your friends about the decadent slice of hazelnut cake that you are about to dive into. I instantly felt a sense of relaxation and calmness as I sat down and just enjoyed the moment. In 2011, UNESCO added Viennese coffee house culture to their list of Intangible Cultural Heritage. Where Can You Find The Traditional Coffee Houses? There are literally five coffee houses to every three people in Vienna alone. 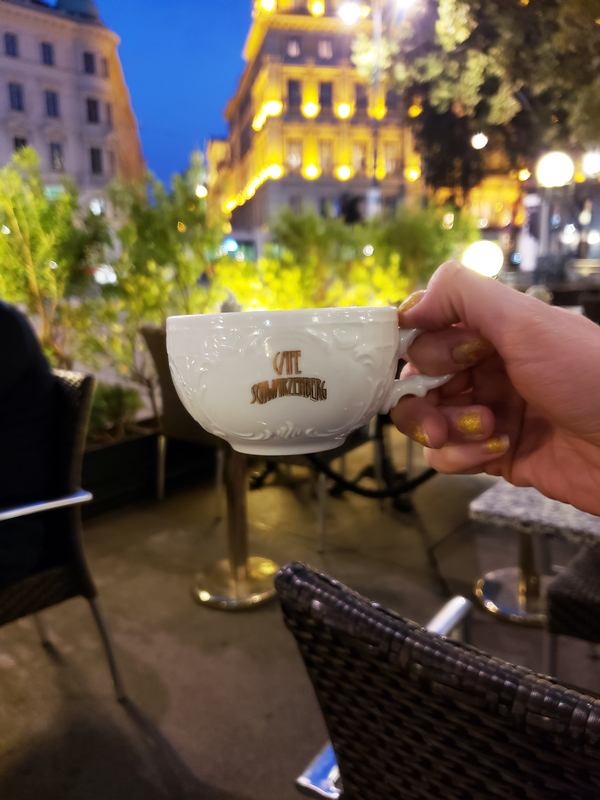 Just kidding, but really though, there are a ton of traditional coffee houses to choose from if you are travelling within Austria. I visited a couple in Vienna, Salzburg and Innsbruck during my travels, so don’t just think Vienna is the only place that will have them. There will obviously be way more to choose from in Vienna, but do keep in mind that some of the more popular places will have lineups, out the door and onto the street…and this time I am not joking. My advice? Do some research beforehand and pick two or three that you really want to visit and then hit the ground running, so that you’re spending quality time enjoying the coffee, cakes and atmosphere rather than wasting your precious time in the line on the street. When To Visit A Coffee House? Visiting a coffee house shouldn’t be visited at any specific time. Whether you are looking to grab a coffee and read the newspaper early in the morning, or grabbing a late night cup of java and enjoying the atmosphere on the street while on your way back to your hotel, anytime is a good time to visit these inviting establishments. 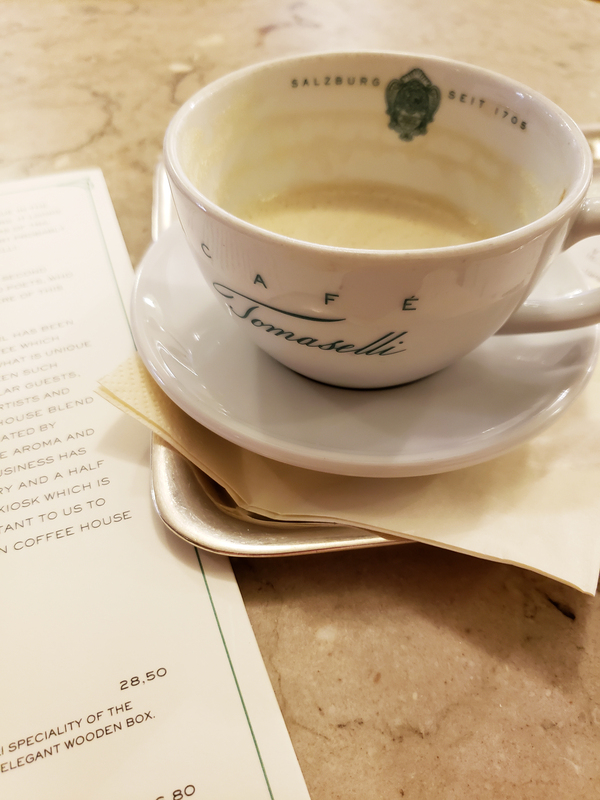 If you do want to avoid the tourist crowds (and who doesn’t to be honest), then get up bright and early and make your way to your favourite haunt to enjoy some quiet time first thing in the morning while sitting with the locals. Do try and avoid mid-day, since that’s usually when crowds are at their peaks. 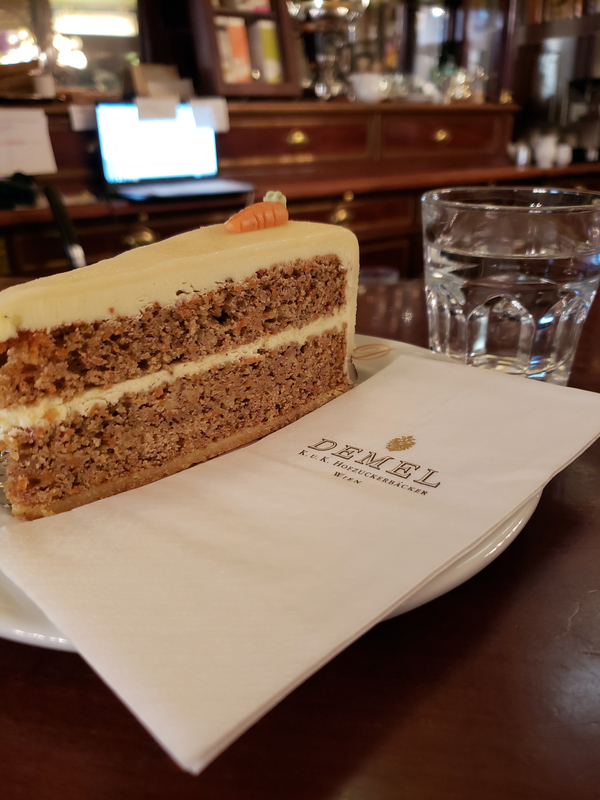 I made the mistake and went to Demel around 2pm and I wanted to crawl away forever due to the overcrowding. #NeverAgain Ugh! Why Is The Coffee House So Popular Among Locals & Tourists? 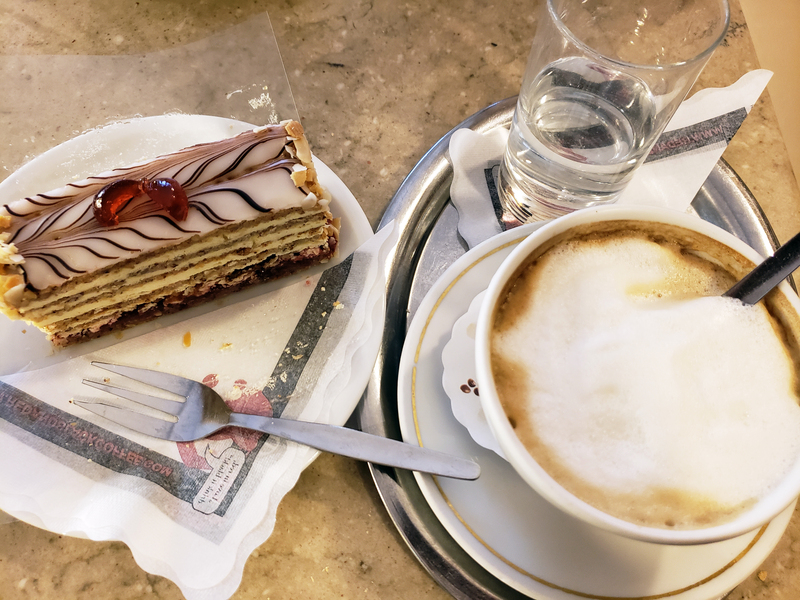 Traditional coffee houses within Austria are so popular with tourists and locals, not only because of their gorgeous interiors and tasty desserts, but also for the service. The servers within these fine establishments tend to act and dress more as butlers than you’re typical waiter/waitress that folks are normally used to back in their home country, making you feel as if you are living the high life, even if it is only for an hour. Now, let’s talk about the presentation, which is still to this day very traditional and fancy. Your coffee is brought to you on a silver platter with sugar on the side if you need it, a glass of water and sometimes you’ll even be given a biscuit or a piece of chocolate, which makes the whole visit more of an exceptional experience rather than just grabbing a standard coffee and cookie and hitting the road. 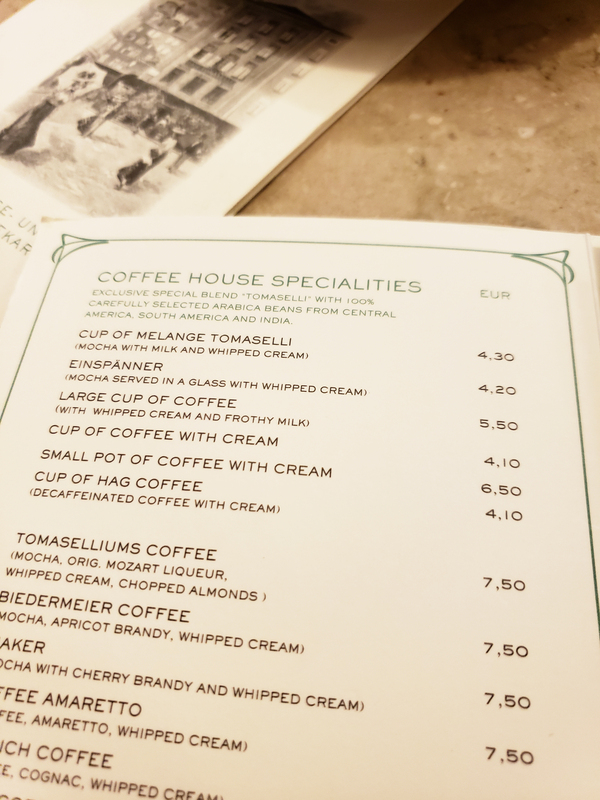 Visiting a traditional coffee house has always been more of an event, which is probably why visitors are curious and enamored by the coffee house culture within Vienna and Austria as a whole. How To Order Your Coffee & Cake Within A Traditional Coffee House? Did you get that? That’s not even half the list either. I’m not going to lie, when I first opened the coffee menu, I was not only in awe, but astounded by the amount of choices and I wanted more than one, but I must warn you, drinking coffee at a traditional coffee house doesn’t come cheap and you are not only paying for delicious coffee and cakes, but also the experience, so just a heads up! Now, onto the important stuff…the cakes! Ohh the beautiful artfully decorated, perfect little slices of heaven. I have to be honest here. I, Tosh Bene, haven’t always been a huge fan of cake. 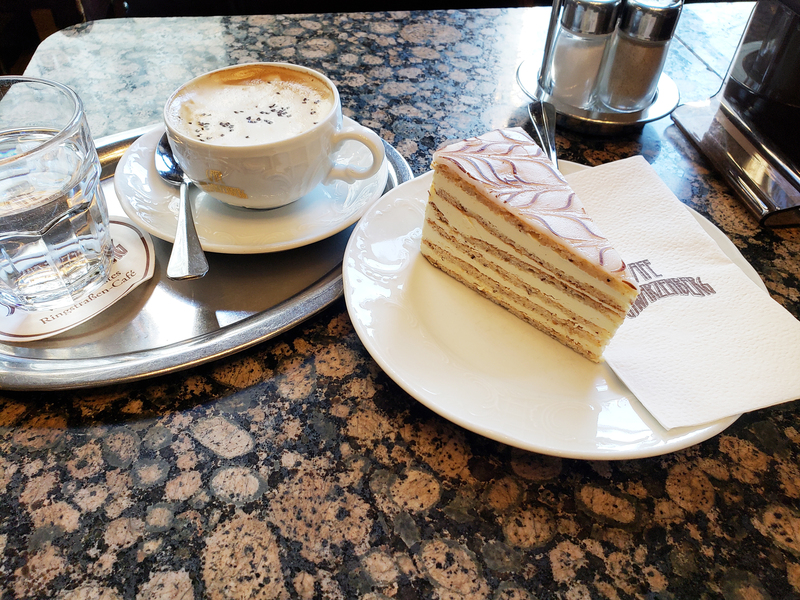 I know, I know, BUT when I do find a cake I like, I will tell you and everyone about it and I absolutely adored the hazelnut slice of cake at Café Schwarzenberg. Go there and get it, you will not regret a single bite I promise you! 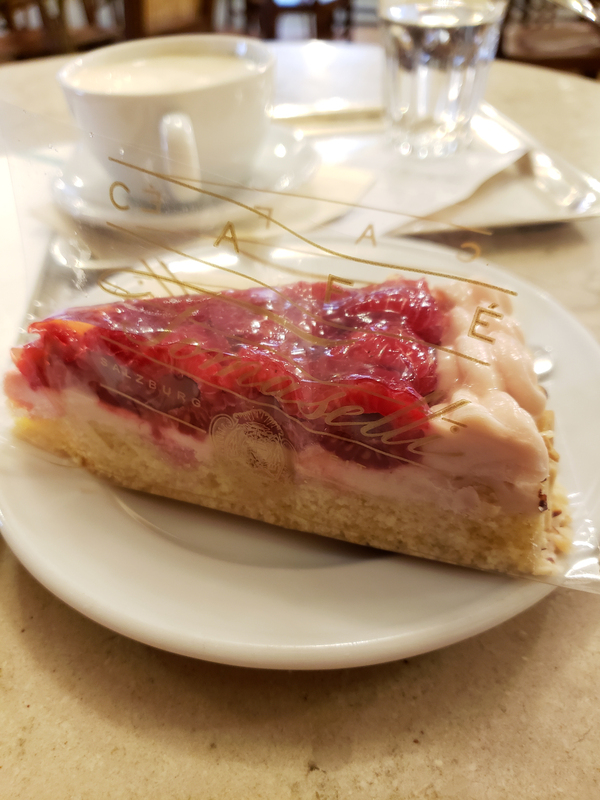 Ordering a piece of cake varies at different establishments though and having not visited these coffee houses before may make you a wee bit confused. Some of the places I went to had me ordering at the counter then sitting down and receiving the cake after I had been seated, I also ordered from the menu as you normally would and I even had the waitress approach my table and present me with the entire cake display on wheels and set out before me to choose from before she reached under the glass tray and placed my choice daintily in front of me. 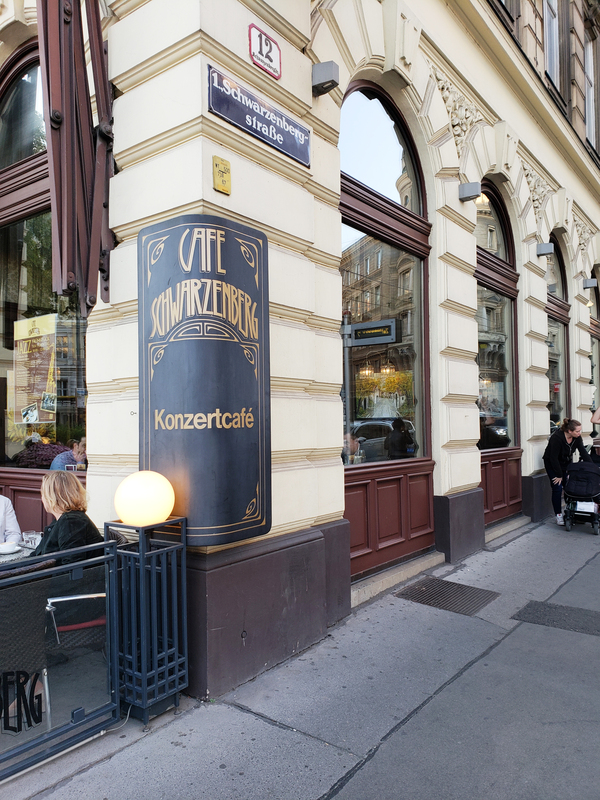 Café Schwarzenberg (Vienna) – A beautiful café with a traditional wooden interior and dazzling chandeliers and is the oldest existing coffee house along the Ringstraße and was opened in 1861 during the construction of the famous main boulevard. The interior is notable for having remained largely the same since it was opened and as soon as you step inside, it feels as though you’ve gone back in time. 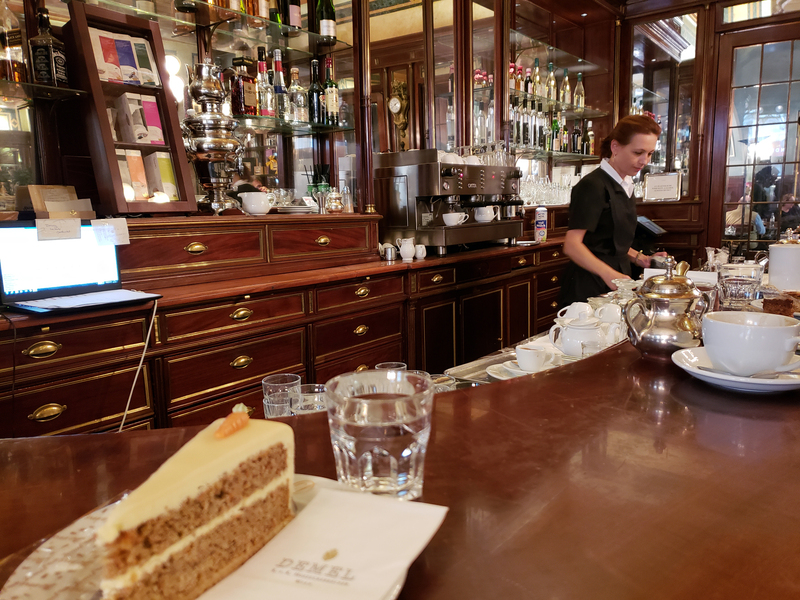 Demel Café (Vienna) – Opened in 1796 on Kohlmarkt, this traditional coffee house shot to success almost immediately. By 1856, it had already become a hotspot among Vienna’s aristocrats and other VIP’s within the country. 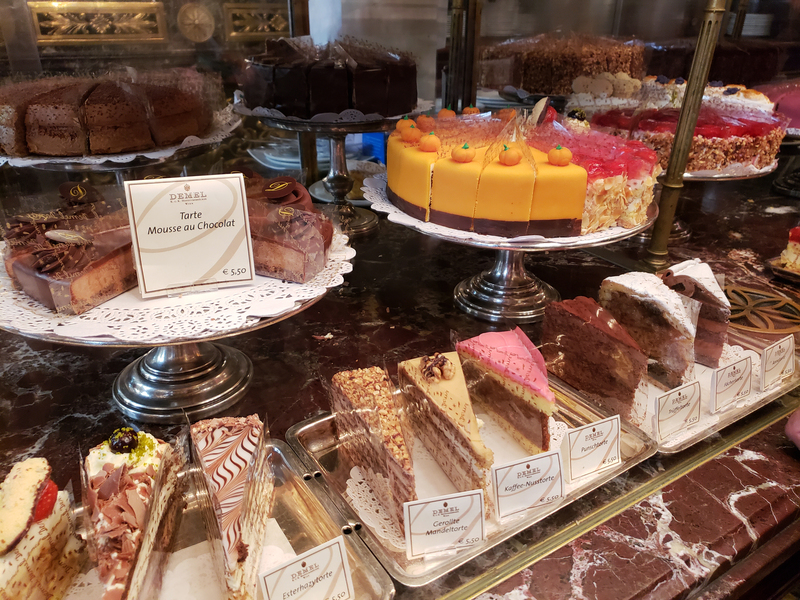 Demel’s cake displays are truly works of art and tantalizes its visitors. Come early to avoid the lines, as there is almost a queue by mid-afternoon. 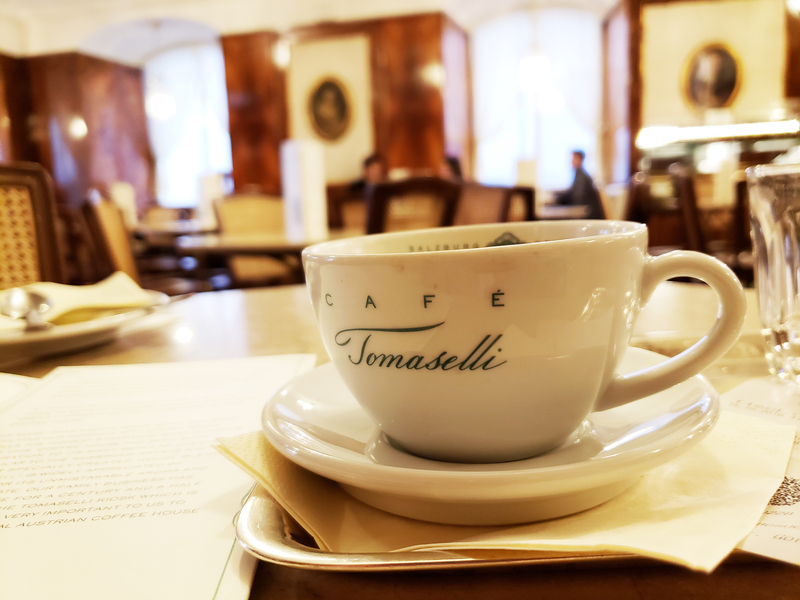 Café Tomaselli (Salzburg) – With its sleek and traditional wooden interior, friendly staff and a history of over 300 years, Café Tomaselli is one of Austria’s oldest cafés and is still family owned to this very day. Cakes are presented to you directly at your table as though you are being shown and sold pieces of colourful fine jewellery on display. The staff was kind and patient as I asked what each piece was while being quite indecisive; they all looked so good! It’s no wonder why Mozart himself frequented this café for his signature warm almond milk. Café Getreidegasse (Salzburg) – A cozy café little located on Salzburg’s main shopping street, Getreidegasse. Great place to pop in, have a coffee and escape the shopping crowds mid-day. 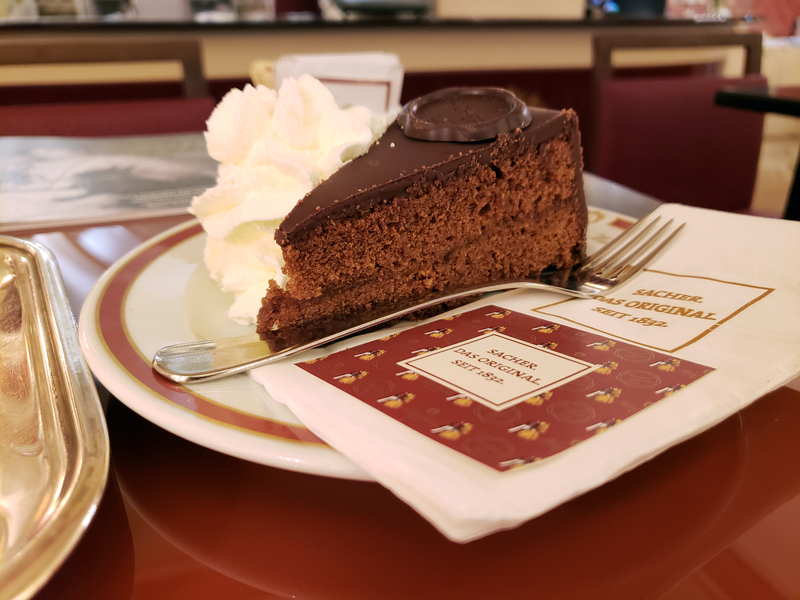 Café Sacher (Innsbruck) – The Café Sacher is attached to The Hofburg Palace in Innsbruck, so after you’re done perusing through The Hofburg, head on over to devour a piece of that delicious Sacher Torte. 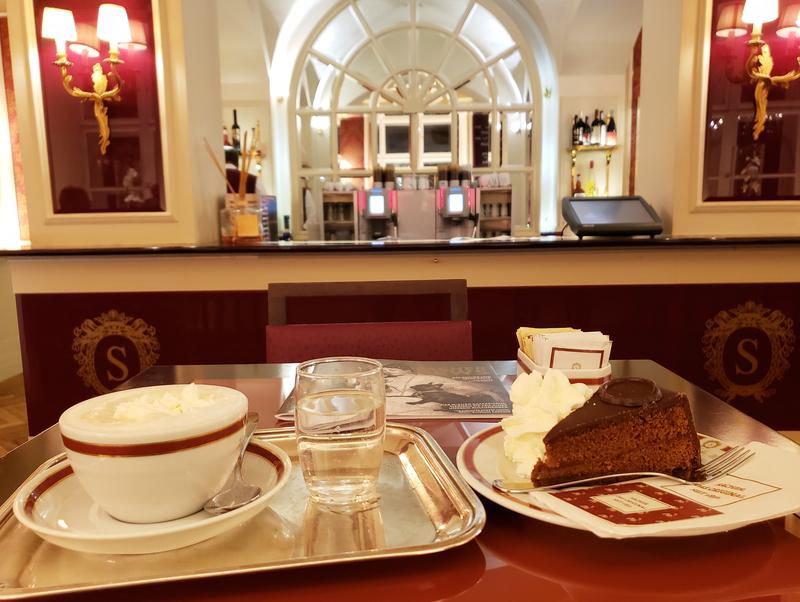 I was able to just walk in, no lines, no waiting and grab a seat inside, whereas the lineup in Vienna’s original Café Sacher was out the door and spilling into the streets. No thanks! 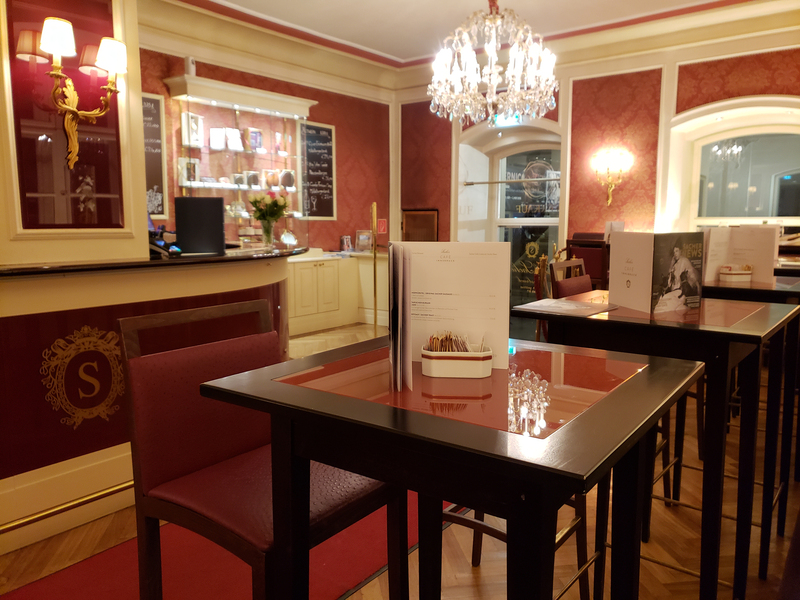 The interior is elegant, bright, inviting and cozy, so it’s the perfect spot to enjoy a slice of the famous Sacher Torte and a great cup of Melange.